I’m a sucker for HURT. I’m only a week out from my third running of one of the hardest of all traditional 100 mile footraces, and instead of moaning over the soreness in my feet or the mass of knots in my leg muscles, I can’t stop thinking about how much I love this event. The beauty of the Hawaiian rainforest, the difficulty of the steep, technical jungle trails, the enthusiasm of the hundreds of volunteers, and the challenge of the aggressive cut-offs add up to, for me, a nearly perfect event. When I first ran HURT two years ago, I barely finished under the thirty-six hour time limit, and this is still one of the accomplishments I am most proud of. I returned last year under different circumstances, mourning the recent loss of a close friend, and to make matters, well, not worse but harder, I managed to give myself food poisoning the night before the race. That time, I only made it forty miles. This year, I hoped to do better. 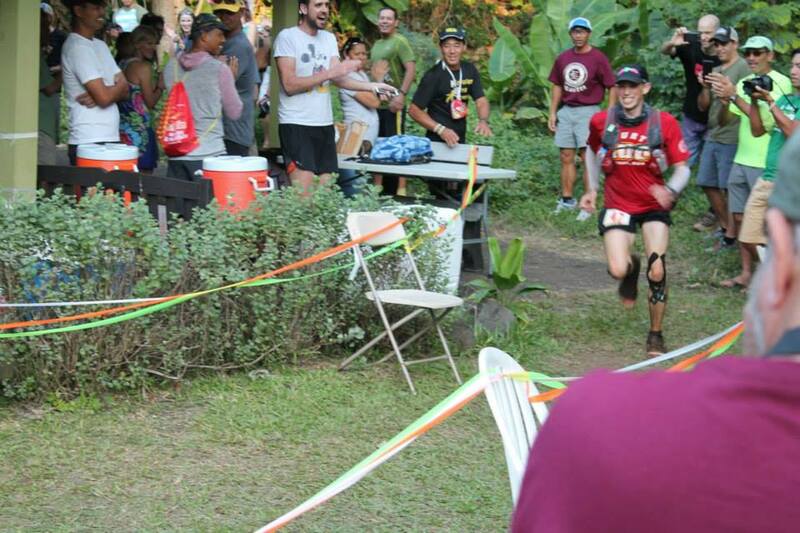 With another two years of ultramarathon running under my belt, I was surely in better shape and generally better prepared than 2013. The odds that anything could come along and make me feel as bad as I did on race morning 2014 were slim to none. Still, there were a few variables. I’d taken some time away from training in the Fall after a vasectomy, after which I’d been too impatient to get back to running. And while the weather in Hawaii isn’t the most unpredictable, with temperatures around 80 Farenheit and 100% humidity, getting some cooling wind or a perfectly still day counts for a lot. On the other hand, I’d heard plenty of horror stories of what happens to the HURT course – and the finishing rate – in the rain. Finally, my knee had been bothering me in the week before the race, leading to a high-Ibuprofen diet. As it turned out, the weather would be near perfect, leading to a record finish rate of 50%. My knee wouldn’t complain once. And as for my training, well, surely there’s never enough of that. More importantly, this year, there would be no sickness and grief. Instead, I showed up rested and relaxed from a week’s vacation over on the Big Island, my mind still more concerned with recent memories of hiking in active volcanoes, diving with manta rays and whalesongs, and snorkeling with wild dolphins than with the adventure ahead of me. If anything, I was afraid I was arriving a little too relaxed. Where was that nervous anticipation? I knew as well as anyone how hard this race could be. Shouldn’t I at least, you know, care? In spite of having rented a room five minutes away, I showed up at the starting line with only a few minutes to spare. I’d almost waited too long to unrelax myself. But if I unrelaxed too far now, I’d burn out on the first twenty mile loop. I shrugged it off, found a spot at the back of the crowd, and waited for the official start. Working my way up slowly from the back had worked well as a pacing strategy at Western States, and I suspected it would work well again here. It was remarkable how much easier even the first climb, Hogsback, was than last year. I guess the body really does like to have fuel and fluid when running up and down mountains all day. Last year’s first loop was harder than anything I would do this year, never mind the second. By the end of the first seven-mile leg, it was clear that a few people (who I would pass on my way back up the mountain as I started the next leg) wouldn’t make it. Many of those who would end up dropping out were far better runners than I, already miles ahead. This is always very sad, especially to hear about on the course where there’s an intense camaraderie, but at the same time it is the result of the challenge that makes HURT so fascinating to begin with. I was surprised to find myself a little slower overall than I thought I remembered from my first year, which was true for the first loop, but I was pacing myself better. I had trained better for the long, grinding climbs, and I wasn’t burning myself out by having too much fun on the early descents. I finished the first loop in about 5:30, and the second in 6:40, putting me about thirty minutes behind where I’d been two years ago. This got me back to the Nature Center just in time to start my first night loop. Here, of course, is where the real fun begins. The jungle cover at HURT is thick enough to provide, effectively, an extra hour or two running without sun, and no hope of getting any help from the moon. With the tricky footing on most parts of the trail, good lighting is key. I used two headlamps, one of them around my waist, to give me good coverage of the terrain while keeping my hands free. However, it took me too long to realize that the batteries in the upper lamp were draining, which both slowed me down and helped make me drowsy. I’ve made this mistake before and know better, but since the light fades slowly there’s no way to be sure when the batteries start to go. This loop was much slower, taking me 7:49, a few minutes longer than in 2013. Many runners find the fourth loop the hardest. Having fasted on caffeine before the race, and music during the day, I had a couple of extra boosts to keep me going. 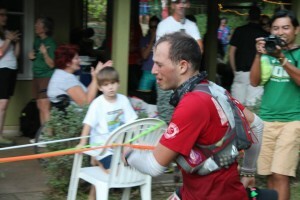 Unfortunately, I also ran into my first stomach issues at mile 67. 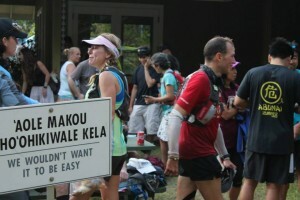 Either the GU Brew at that aid station had been mixed too strong or it had settled and I’d gotten the dregs. In any case, it was much too salty, but I didn’t have enough plain water to get me to the next aid station without drinking a decent amount of it. 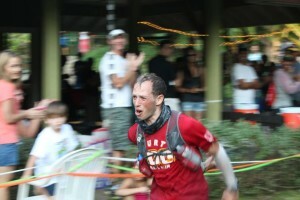 It took at least 20 miles for my stomach to recover, and it might not have recovered fully until the finish. I’d hoped to start making up some time, but this loop took me 7:55, twenty minutes slower than 2013. Now I was starting to get worried. Pacing myself for a fast finish is one thing, but pulling into Nature Center less than an hour ahead of the first cut-off is another. Hannah Roberts, the 2013 women’s champion, helped me rally and get turned around for loop five right away. And it worked. I was able to jog up climbs I’d walked for the previous 80 miles, and maintain a 7 hour loop pace for more than 15 miles. By the top of the final climb up Mount Tantalus, however, the adrenaline was wearing off, my stomach was turning sour, and I was being passed by runners I hadn’t seen since the bottom of the mountain. This last turned out to be a blessing in disguise. When Franco Soriano passed me on his way to his first successful HURT finish, I shouted some encouragement, then fed off the intensity of the emotions I could tell he was feeling to ride an endorphin surge of my own. I ran after him the rest of the way up the hill. It’s hard to describe how overwhelming the waves of emotion and endorphins can be late in such a difficult race, when the chemicals and hormones in your body are out of whack and your brain is both vulnerable and driven. When you reach the point that you know, finally, that you will finish successfully, it can be like nothing else I’ve ever experienced. I sprinted the last half mile to the Nature Center. When I kissed that sign to make my finish official, it felt like triumph, like redemption, like validation, like a million things I can never name. 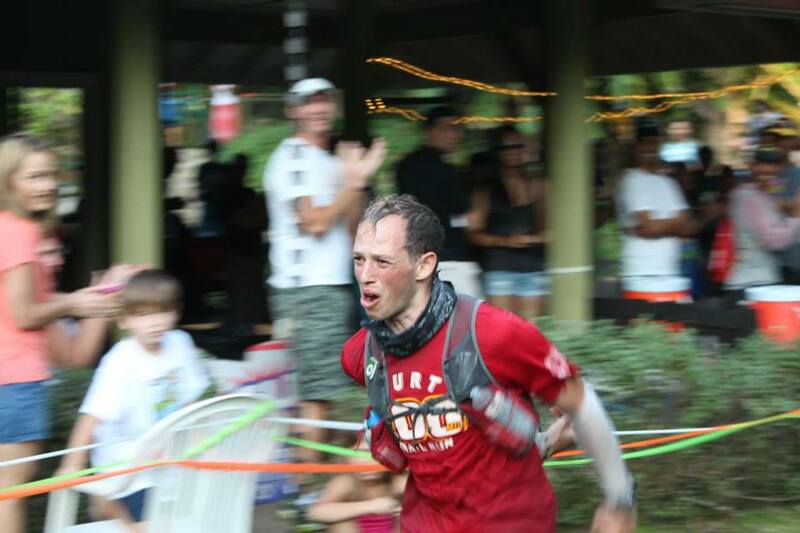 I ran my final loop in 7:13, 1:17 faster than 2013. 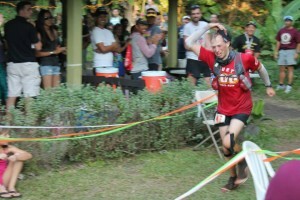 This year I finished the HURT 100 in 35:19:28, 17 minutes faster overall. I guess there’s something to this pacing stuff after all. 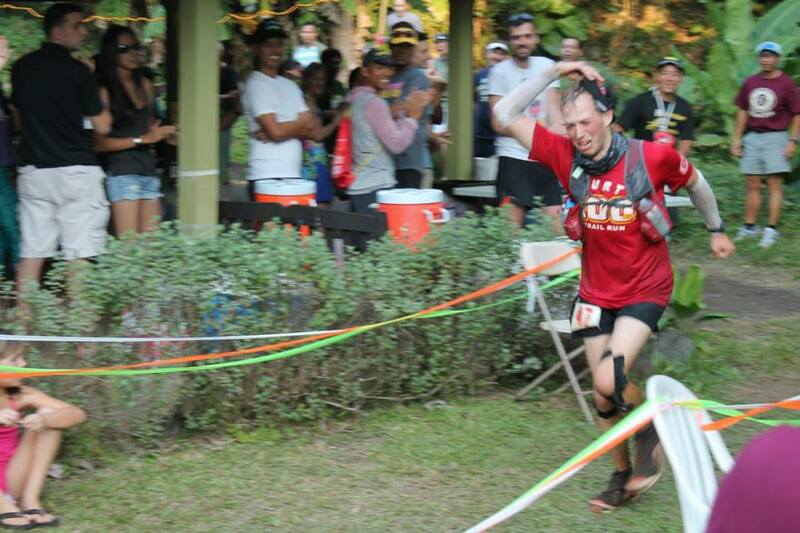 HURT 100 finish, 2015. Photos by Allen Lucas. And then I hosed myself off behind the Nature Center and hopped on a plane for Oakland. I felt redeemed, and like maybe I was done with HURT. Maybe I’d find some other way to torture myself next winter. We all know how long that thought lasted. 1: Leaving out self-supported adventures like Plain 100 and Barkley. 2: Pro tip: no, really, wait three weeks to run. Three. Not two. Three. 3: I never got around to writing up Western States. Long story short, it went great, and I was right about on track for a 24-hour finish when I had a severe asthma attack at mile 80. I walked it in from there and finish in just under 27 hours.